With a starting price of 213,000 euros, the 8C Spider is Alfas most expensive model. BALOCCO, Italy -- Germany will be the largest market for the limited-edition Alfa Romeo 8C Spider supercar. Germany will get 100 units, ahead of the 75 units destined for Italy and 50 units for the U.K., Renzo Barbiero, sales director of the 8C project, told Automotive News Europe. Alfa will build 500 units of the 8C Spider, as it did with the hardtop version of the car, the 8C Competizione. Germany will receive the highest number of units because sales people there have booked the highest number of reservations for the car. About 400 people have made non-binding reservations in Germany. Worldwide, a total of 1,200 reservations have been made for the car, which debuted at the Geneva auto show in March 2008. Alfa received 1,100 reservations for the 8C Competizione coupe, which debuted in 2006. Alfa has used a two-phase process to determine how many 8C units will go to the various markets. First, potential buyers make the non-binding reservation for the car. Based on the number of reservations made from each country, Alfa allocates a fixed number of units per market and then starts taking orders. To make an order, a person must make a 30 percent non-refundable deposit. Barbiero said Alfa already has received 350 orders for the 8C Spider. 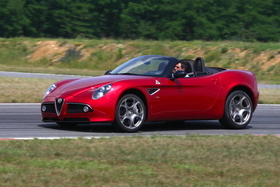 At 213,000 euros (about $302,620) in Europe, the 8C Spider is Alfas most expensive model ever. U.S. and Italy were the two largest markets for the 8C Competizione, with 84 deliveries each. Germany was just behind at 81 units of the coupe. The Alfa 8C buyer normally owns at least a Ferrari, many of them are also Alfa collectors, Barbiero said. The 8C has a steel chassis and a carbon-fiber body. The 4.7-liter V-8 engine delivers 450hp and is mounted longitudinally behind the front wheels. To optimize weight distribution, the transmission is mounted in the rear, in a transaxle design. Maserati builds the 8C for sister brand Alfa at its plant in Modena, Italy. Deliveries to European customers started this month. The cars production run will be completed by the end of 2010.